In the course of restructuring corporate governance of financial subsidiaries of Samsung Group, Samsung Life Insurance which only had held 5.48% of stocks of as of July 2014 became its one and only major shareholder holding about 96% of stocks of Samsung Asset Management after July 2014. By the power as the one and only major shareholder of Samsung Asset Management, Samsung Life Insurance approved the squeeze out of minority shareholders under the section 360-24 of the Commercial Code, and asked the minority shareholders to return their stocks for 22,369 won per a stock. The section 360-24 of the Commercial Code requires managerial necessity for squeeze out which means ① there is justifiable managerial purpose, ② a squeeze out is a proper method for the purpose, ③ a squeeze out is a method which encroaches on the least of interests of minority shareholders and ④ the advantage entertained by the company is greater than the disadvantage of minority shareholders. In this case, however, it is hard to find managerial necessity because there is no synergy for the squeeze out and the disadvantage of minority shareholders is greater than the advantage of the squeeze out for the unfair appraisal of the stocks. Samsung Life Insurance offered 22,369 won for the stock’s price based on a valuation report by KPMG; however, the appraised price is undervalued considering various points including the historical AUM size of asset management industry for the last 10 years. 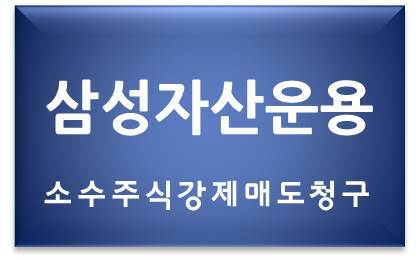 Hannuri on behalf of minority shareholders of Samsung Asset Management filed a suit requesting to cancel the approval of the squeeze-out. In this suit, Hannuri is going to do our best to get the best result for the minority shareholders including negotiation with the company or filing suits for fair appraisal.